The same principles for using the interdental brush in between roots also applies in between the teeth. Take the special brush and rest it on the tooth surface where the teeth touch at a 45 degree angle and slide it into the space below where the teeth meet together (the bottom right picture). Slide it down the side of the tooth and it will go below the gum. Keep going till the small brush cannot go any further. This is very important especially where the root is exposed. 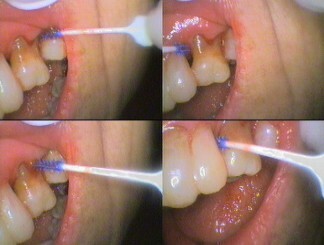 The top left picture shows the root exposed on an upper molar with half of the caredental interdental brush tip below the gum. The brush tip is in a “POCKET”. This is a term used to describe the loss of bone and attachment between the root and the bone, leaving a space in the gum. This valley or pocket harbours bacteria that of a type that are destructive to the body. The environment in a pocket has low oxygen content and anaerobic (“oxygen hating”) bacteria thrive here. These bacteria promote the loss of bone of tooth attachment very quickly if they are not kept at bay. Daily cleaning of the pocket is a must. Adding antiseptics to the brush delivers a long lasting hostile environment to these bacteria. Often the pocket can be eliminated buy gum surgery by removing gum to the level of the bone. This exposes more of the tooth but makes it a lot easier for cleaning and makes it harder for the anaerobic bacteria to survive. Sometimes artificial bone or bone graft material can be placed into a bone defect to stimulate bone growth and reduce the pocket that way. For complicated cases a referral to a gum specialist may be necessary. The top right picture shows brush with good access to clean the exposed root space of an upper molar of three roots. This access is not always possible in upper molar teeth of three roots. The principle of sliding the brush on the tooth surface to clean the space called the furcation area applies here. As the brush gently enters the space and cannot go any further, press against the root and firmly wipe the plaque (germs and its sticky byproducts) off the root. The bottom left picture shows the furcation area able to be accessed from the cheek side of the tooth. At SeymourDental, the dentist will explain how to clean these areas and check to see if you have understood by watching you clean these areas. This must be done daily for proper maintenance to prevent hardening of the plaque to form calculus. Calculus or tartar is caused by calcium in the saliva being concertrated by the plaque. This actually kills the germs but the leaves a harden mass on the tooth surface which allows more bacteria to hide. IT IS VERY DIFFCULT TO CLEAN THIS CALCULUS OFF WITH A BRUSH. ONLY THE DENTIST CAN CLEAN IT OFF, (OFTEN WITH DIFFICULTY IN SOME AREAS OF THE MOUTH). This is why it is important to clean daily as even after a dentist clean, calculus can start forming in about 2 days. Regular cleaning by the dentist means reducing the time calculus is present to cause damage to the bone AND there is less inflammation of the gum which means LESS PAIN WITH CLEANING. I’m all for that and I hope you are too! Regular cleaning by the dentist can be as often as every 3 months in people who have difficult areas to clean, but generally every 6 months.